The project, located in Seattle’s historic Pioneer Square neighborhood, featured a mixed-use development consisting of eight stories of office space above one level of ground floor retail and two below-grade parking levels. GeoEngineers also provided geotechnical recommendations to support the tower crane. GeoEngineers used historical research and geotechnical investigation (drilling) to confirm that the site had been impacted by neighborhood-wide contaminants left from the Great Seattle Fire of 1889. GeoEngineers monitored groundwater levels during construction to confirm that offsite levels were not lowered below threshold levels. 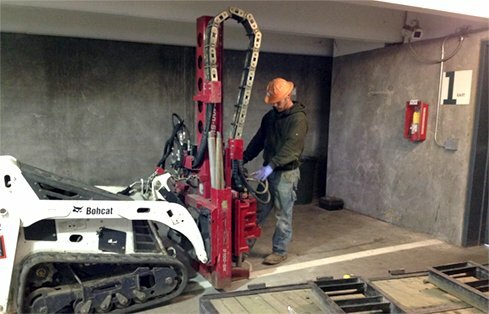 The team recommended a secant pile temporary shoring system for excavation support. The secant pile system enabled the project to extend below the groundwater table without extensive temporary dewatering. In 2015, Hudson Pacific Properties launched a plan to redevelop a site in Seattle’s historic Pioneer Square neighborhood with a mixed-use development consisting of eight stories of premiere Class A office space (as defined by the Building Owners and Managers Association) above one level of ground floor retail and two below-grade parking levels. GeoEngineers provided environmental and geotechnical consulting services for the project. The project site is located near the former shoreline of Elliott Bay and has seen multiple cycles of industrial and commercial development and regrading throughout its history. GeoEngineers’ historical research and site investigation revealed that the site was impacted by neighborhood-wide contaminants left from the Great Seattle Fire of 1889. To keep to the project schedule, GeoEngineers worked closely with the project design and construction team to coordinate soil cleanup while construction excavation continued. GeoEngineers also provided documentation to the Washington State Department of Ecology (Ecology) in accordance with the Model Toxics Control Act (MTCA) to verify the soil and groundwater cleanup. In addition to environmental services, GeoEngineers’ geotechnical engineers developed recommendations for foundation support, temporary dewatering and excavation support. Subsurface conditions posed certain challenges. The near-surface soils in the vicinity consist of compressible fill and estuarine deposits overlying competent glacial till, and groundwater at the site is shallow due to the proximity of the site to Elliott Bay. The extensive dewatering required at the site could have caused settlement problems for adjacent improvements. To solve this challenge, the team recommended a secant pile temporary shoring system for excavation support. The secant pile system enabled the project to extend below the groundwater table without extensive temporary dewatering. 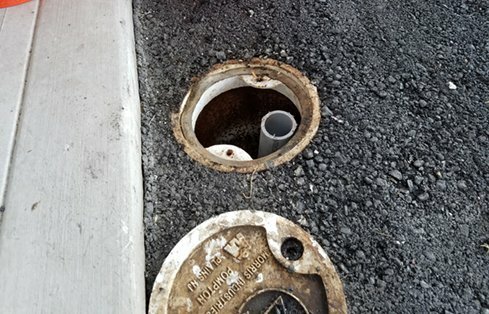 GeoEngineers also implemented automated groundwater monitoring to give the project team access to real-time groundwater levels during construction. The system gave the project team confirmation that offsite groundwater levels were not lowered below threshold levels. 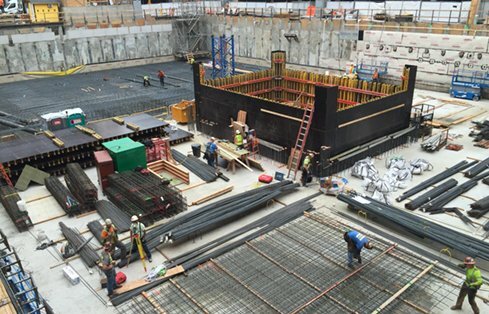 The shoring system was designed to accommodate complex adjacencies with existing historic buildings to the north and east of the project site and the Alaskan Way Viaduct to the west. 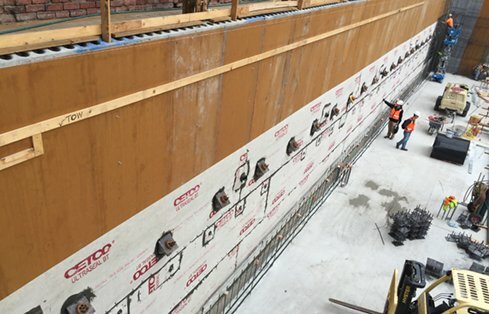 Internal braces were used locally to enable shoring construction adjacent to a utility vault. GeoEngineers also provided geotechnical recommendations to support the tower crane. Given the tight site area, the tower crane used for construction was supported on drilled shaft foundations and located immediately adjacent to the secant pile shoring wall. Extensive subsurface explorations to evaluate the extent and nature of soil contamination. Preparation of an Environmental Construction Contingency Plan to manage clean and impacted soils during excavation. Remedial excavation oversight, documentation and confirmation soil sampling during construction. Preparation of the Cleanup Action Report for Ecology to demonstrate the successful characterization and remediation of the site. Design of a high capacity full footprint structural mat foundation bearing on competent glacial till soils. Analyzing the axial and lateral capacity of drilled shafts to support the tower crane. Analyzing the vertical and lateral loads that would be transferred to the temporary shoring system during operation of the tower crane. Setup and calibration of transducers, automated datalogger and a cellular modem in groundwater monitoring wells. 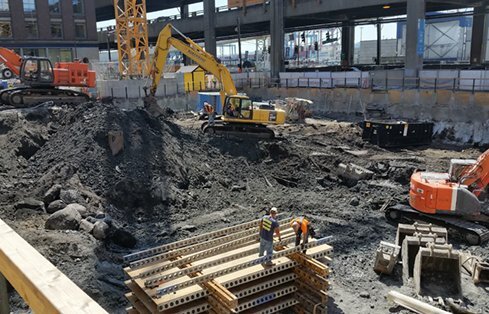 GeoEngineers’ complete suite of geotechnical and environmental services helped the Hudson Pacific Properties team successfully construct the project and mitigate the complex adjacencies, protect adjacent improvements and coordinate soil cleanup.